Rep. Rob Kauffman (R-Franklin), chairman of the House Labor and Industry Committee, held a hearing at the Capitol on workplace harassment and sexual misconduct in the workplace. HARRISBURG – Rep. Rob Kauffman (R-Franklin), chairman of the House Labor and Industry Committee, today held a hearing on workplace harassment and sexual misconduct in the workplace following nationwide reports on employee sexual harassment. The committee heard from various panels of testifiers representing victim advocates, the legal community, lawmakers with legislation before the General Assembly and others. During the hearing, it was reported that up to 85 percent of women and 19 percent of men have experience sexual harassment in the workplace. Furthermore, 85 percent of victims never file a formal legal charge and 70 percent never make a formal complaint with their employer. Many victims have been found to harbor feelings of fear and shame over the harassment. Victims fear no one will believe them, that they will face professional or peer retaliation, or that their career will be jeopardized. Also discussed during the hearing were best practices for employers in regard to cultivating an environment that combats harassment and allows for and encourages reporting of any such behavior. Kauffman noted that sexual harassment in the workplace is a bipartisan issue, and that the committee is considering measures from both Republican and Democrat members. Legislation highlighted during the day-long hearing included two resolutions to create the Task Force on Harassment and Sexual Misconduct in the Workplace, and direct the Joint State Government Commission to study the frequency of harassment and sexual misconduct in state government. 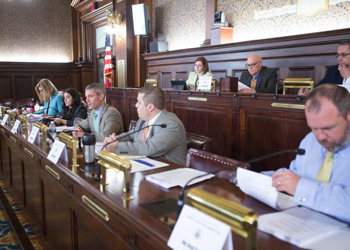 Five bills were also discussed that would reform current policies in the Pennsylvania General Assembly for the investigation and resolution of allegations of sexual harassment, increase the amount of time for filing discrimination and harassment complaints, and expanding sexual harassment protections for employees and interns in the workplace. “The House Labor and Industry Committee will continue discussions about this issue and work to move substantive legislation to address workplace harassment to the full House for consideration,” said Kauffman.